← Being There…or we knew the bride when she used to marry rockers…. We live these days in a weird era where art and tech are linked in ways which I don’t believe we understand very well and don’t think about enough. Maybe we are in some transition to a culture in which tech is believed to be art and art is believed to be -I don’t know – tech…? Whatever the artist says it is…? Obsolete…? Lea, my wife, and I were coming home from one of her art exhibition openings last night and somehow we got on the subject of Claude Monet. The art opening was part of a series of events in which artists, writers, and craftsmen and women had simultaneously occurring book fest, art exhibition opening, and crafts fair. This is the sort of event that arts groups hold more and more often in these same days of this our life. Artists hoped that book lovers would stop by the art exhibition, writers that art lovers would stop by the book fest, crafts people – well, people still buy crafts, kinda sorta (more than they buy fine art and books, at least), so the crafts people were likely simply being helpful. Yeah. I know. This is all too common these days. And yes, I’m rambling, but I’ll get to something in a minute. Bear with me. So, to that conversation Lea and I were having on the way home. At the book fest she had talked with a person who visits in schools and promotes student engagement in visual art. This person talked with Lea about the work in paint “greening” being done by the folks at Gamblin. They are finding ways of making artists’ paints that retain their vibrancy even as they remove the metals and other chemicals that make those paints toxic to artists who use them. She was pretty excited by this, as was I – and then she mentioned Monet. 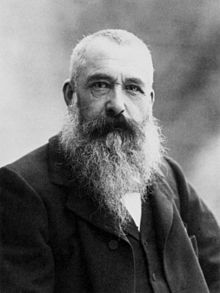 It seems Monet was taken by the development of new forms of blue paint – and I noted that Monet’s painting was thus changed by technology. Lea argued that the development of new types of paint was more about science than about technology. What then ensued, of course, was a bit of bantering about the differences between tool dominated cultures and technology dominated ones, about what the difference between basic and applied scientific research, about how art is being eviscerated by technocrats. Well, that last one was more in my head than in the conversation. What’s been happening at an accelerating pace over the last 35 years or so (but especially over the last couple of decades) is that multiple forms of technology – and I use Postman’s broad definition of technology here, so I include the imposition of systems over human behavior in my consideration (i.e., bureaucracies, governments, business organizations, perhaps even political or economic systems) – have been having impacts on art unimaginable a few decades ago. These impacts have affected the four main areas of any artist’s life. Whether one is a visual artist (painter, sculptor, photographer, et. al. ); literary artist (poet, novelist, essayist, et. al. ); or musical artist (composer, performer, et. al. ), one’s ability to (1) make art; (2) reach audiences; (3) make money; (4) control one’s ownership of one’s work has been profoundly changed. While there has been a great deal of trumpeting of the liberating and democratizing effects of technologies during this period (particularly the most profound and wide reaching of these, the Internet) to aid artists (specifically with #2 and #3), the reality is that not artists but audiences – and certainly tech companies – have benefitted most both aesthetically and economically from the rise of these technologies far more than artists. Audiences have resisted paying for content they seem to see as free. Tech companies have simply taken artists’ work for their own, calling it content and refusing to pay for its use even when they themselves made money from it. So not only have artists suffered noticeably where #3 is concerned, they have also struggled with #4. This is the current state of affairs. In Part 2 we will look at how artists have been able to use technology to make art – and how that use has changed/is changing definitions of art. And whether art, in any form, can survive. Or if artists, like everyone, are merely to be sharecroppers in Google’s fields, as Cory Doctorow suggests. The first in a series of four pieces on Art and Technology by Author and Professor, Jim Booth. Well worth reading whether you are a visual artist, writer, or musician.